Habborella was a worldwide Habbo event spreading across all the active hotels in 2008 just in time for Valentine's Day. The promotion didn't just include competitions, it also included a new furniture range which would eventually be accustomed to Valentine's Day in the future years. 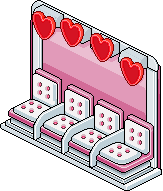 The furniture is now classed as love/Valentine's furniture as opposed to Habborella and some of the original range is now released each year. The event saw 9 new items enter some hotels but not all. The United Kingdom hotel didn't receive a lot of then Grey Sharebears which made them immediate Super Rares. This soon changed as a mega deal saw the Super Rare released at a giveaway price, thus rapidly destroyed the original value. Most of the bears now are worth up to 2 credits. Chocolate Who might these be for? This page was last edited on 8 January 2017, at 16:20.